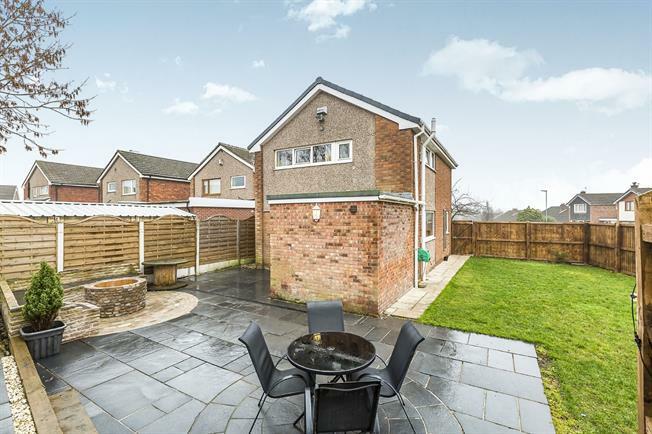 3 Bedroom Detached House For Sale in Preston for Asking Price £230,000. UPVC double glazed entrance door. Double glazed uPVC window facing the side. Radiator, laminate and carpeted flooring. Staircase leading to the first floor. UPVC double glazed door. Double glazed uPVC window facing the side. Radiator, tiled flooring, tiled splashbacks. Wood work surface, fitted wall and base units, one and a half bowl sink with drainer, integrated electric, double oven, gas hob, stainless steel extractor, integrated washing machine, dryer, fridge/freezer. Electric up and over door. Power sockets and lighting. Double glazed uPVC door. Double glazed uPVC window facing the rear.